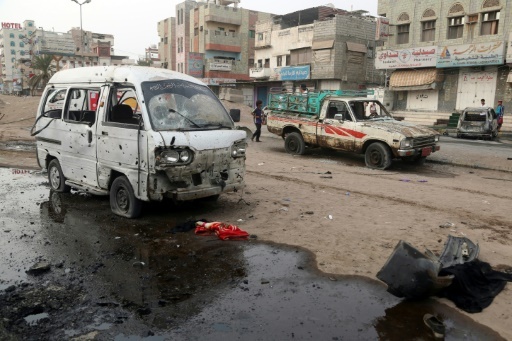 Sanaa (AFP) – A series of explosions Thursday on Yemen’s rebel-held port city of Hodeida killed 55 civilians and wounded dozens of others, the Red Cross said, denouncing the “reprehensible” disregard for human life. The attacks, which were also denounced by a senior UN official, come as the United Nations has said it will invite warring sides in Yemen for talks on September 6 in Geneva to discuss a framework for peace negotiations. Since 2015, Saudi Arabia has been leading a military campaign to restore the internationally recognised government to power and push back the Huthi rebels, who still hold the capital Sanaa. The International Committee of the Red Cross on Friday said 55 civilians were killed and 170 others wounded “when a series of explosions rocked densely populated districts of the coastal city, including a fish market and the area around Al-Thawra Hospital”. It was the first independent toll since the attack took place. An earlier toll Thursday by medics and witnesses had said at least 20 people were killed and 60 wounded in an air strike at the Al-Thawra hospital and the bombardment of the fish market in Hodeida. Al-Thawra hospital — Yemen’s largest — is supported by the ICRC, which also said that two ambulances were destroyed in Thursday’s attacks. AFP / ABDO HYDER. 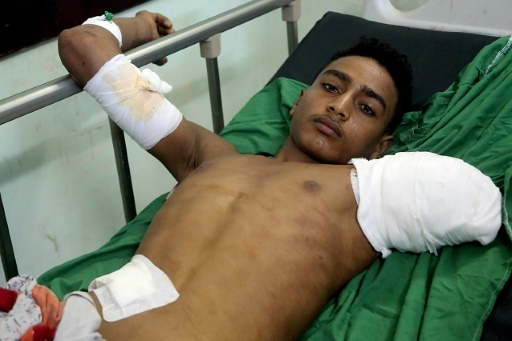 A Yemeni man lies in a hospital bed on August 3, 2018, after being wounded in a reported air strike on the Red Sea port city of Hodeida. But the ICRC said the details of the attacks were still unknown. “While the exact circumstances around the ground explosions are still unknown, this lack of respect for civilian life and civilian property is reprehensible,” Johannes Bruwer, head of the ICRC delegation in Yemen, said in a statement on Friday. “The scenes coming from Hodeida are horrific. The disregard of international humanitarian law in Yemen cannot be tolerated,” said Bruwer, condemning the attacks. Lise Grande, UN humanitarian coordinator for Yemen, earlier said hundreds of thousands of people depend on Al-Thawra. “This is shocking,” she said of the attacks. “Hospitals are protected under international humanitarian law. Nothing can justify this loss of life,” she added. Yemeni government forces backed by the Saudi-led coalition have been conducting an offensive to capture Hodeida from the Iran-backed Huthi rebels. Last month they said they were pausing the assault to give UN mediation efforts a chance. But strikes have picked up again around Hodeida since the Saudis last week said that two oil tankers operated by one of the kingdom’s companies were attacked in the waters of the Red Sea. Rebel-run media outlets have accused the coalition of carrying out Thursday’s attacks in Hodeida. But the coalition’s spokesman, Turki al-Maliki, on Friday denied the charges, accusing the Huthis of having bombed the hospital and the fish market. The nearest target hit by the coalition on Wednesday or Thursday was more than two kilometres (1.2 miles) away from the two sites, Maliki told a news conference in Riyadh. The fighting around Hodeida has raised UN fears of a new humanitarian catastrophe in a country already standing at the brink of famine and gripped by a deadly cholera epidemic. “Every day this week we have seen new cholera cases in Hodeida, and now this,” Grande said. In Geneva, the World Health Organisation (WHO) warned that Yemen is likely to be struck by another “major wave” of cholera cases, calling for a three-day truce to allow vaccinations. AFP / MOHAMMED HUWAIS. Martin Griffiths, the United Nation’s special envoy for Yemen, arrives at Sanaa international airport on July 25, 2018 for talks with rebels. UN envoy Martin Griffiths told the Security Council on Thursday “a political solution” to end the war in Yemen was “available” and urged world powers to support the new push for peace negotiations. Resolving the crisis over Hodeida would have to be part of a “comprehensive political settlement” between the rebels and the government, he said. Griffith also expressed concern that Hodeida — a key entry point for humanitarian aid — “could be a flashpoint” that may derail the push for talks in September. 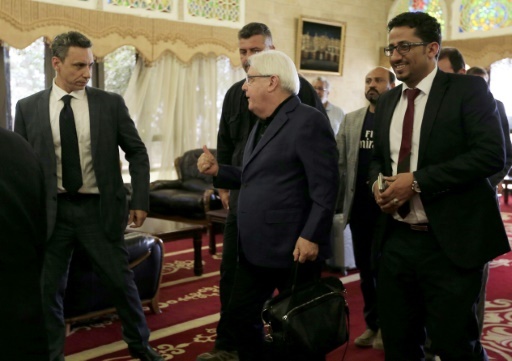 A Yemeni official told AFP the internationally recognised government would attend the Geneval talks although it was “not optimistic” over the outcome, while there has been no response from the rebels. Featured Photo: AFP / ABDO HYDER. People walk past damaged cars at the entrance of Al-Thawra hospital after an air strike in the Red Sea town of Hodeida on August 2, 2018.